The DRX9000 provides a program of treatments for relief from pain for those patients suffering with low back pain at Cousineau Chiropractic. Physician directed care consists of a prescribed treatment period that provides intermittent cycling distraction forces to relieve pressures on structures that may be causing low back pain. Pain associated with herniated discs, protruding discs, degenertative disc disease, posterior facet syndrome and sciatica will respond. It achieves these effects through decompression of intervertebral discs or in other words, unloading of discal pressures via distraction and positioning. The DRX9000 uses state-of-the-art technology to gradually relieve neurocompression often associated with lower back pain. 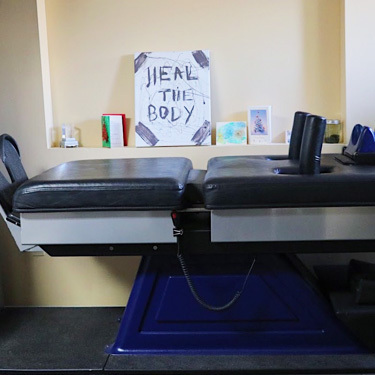 The process has been proven to relieve pain by enlarging disc space, reducing herniation, strengthening outer ligaments to help move herniated areas back into place, and reversing high intradiscal pressures through application of negative pressure. All without inducing further damage to the spine like surgery so often does. Pre- and post- treatment MRIs have shown greater than 50% reduction in the size and extent of herniations after four weeks of treatments with the DRX9000. In fact, during the initial study more than 82% of patients report relief of back pain with the DRX9000. 40% of Adults have had back pain in the past month . Many severe back and leg pain sufferers, after trying many treatments, even surgery, give up and believe that they will have lifetime pain; that there is nothing that can be done. If you have been told that you need surgery to correct your severe neck, low back or leg pain, there is an alternative. Spinal decompression is a non-invasive and non surgical. DRX9000 can increase disc spaces and reduce protrusions that cause severe pain. Call us to schedule a Complimentary, consultation to see if you qualify for treatment.